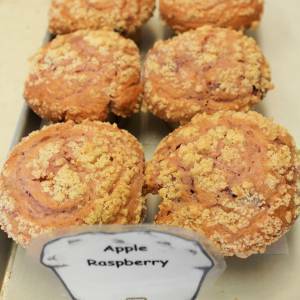 It is rumored that these muffins are made from Golden Apples and Ruby Raspberries. So imagine, somewhere there is a splendid orchard where the apple boughs hang heavy with gilded fruit, where vines crawl with crystalline cardinal gems. And there is a keeper of order and rule, who tends his sweet candies and keeps none for himself but grinds each into fine flour that he bakes in his clay kiln in adamantium muffin trays. In short, these are the richest of muffins. They’re literally made from precious minerals and priceless gems. Enjoy!